Elizabeth Frankie Rollins has published work in Drunken Boat, Conjunctions, Green Mountains Review, Trickhouse, The New England Review, and The Cincinnati Review, among others. Author of The Sin Eater, Corvid Press, she's previously received a New Jersey Prose Fellowship and a Special Mention in the Pushcart Prize Anthology. 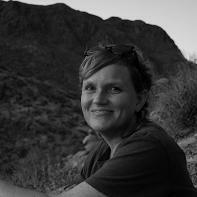 She teaches writing at the Pima Community College and the University of Arizona Poetry Center. She is on the board of the non-profit writing center, Casa Libre en la Solana. When you talked, your words were white, bleached branches, dusty chalk stones, more bleak heat in a desolate wasteland. You delivered them lying down. You were tired, you said, but you loved me. Looking up into my face, angling your head, half asleep, you said it. “Love you,” you said, and then closed your eyes. This was what you had become, a solitary figure on a bed of stone. I came and went, circling you, looking for things to do, then coming back. I leaned up against your stone and watched the stars appear in the sky. I talked to you a lot. It seemed like you might be listening. If my shadow crossed the sun that shone on your face, you might open your eyes and ask, vaguely alarmed, “Is everything okay?” But before I'd answer, you'd shut your eyes already. Your words were like pebbles, kicking across the hard ground. I don't remember when we came to live in the desert, but you liked it. Once we lived in a little house near a river. We were very happy. When we first moved in, we laughed often. We had friends over. We swam in the river. We ate and drank and made love in different rooms. After a while, though, you began to seek, to want, this dryness. I saw you vanishing into it, and I followed you. Out of love. Out of habit. The desert was not disturbed by the likes of my weather. The humidity, flash floods, and storms of water that I represented were meaningless. That flat land sucked my moisture in through porous sands effortlessly, so that silence, and your sleep, could prevail again. Finally, I told you that I was parched, that I was going to seek some new place, some place where water might fall. You sent a lizard skittering across the rocks. The lizard blinked, puffed his chest red, and fell motionless for hours, staring out at something else. After that, I set out a little ways and began building near an old arroyo that looked like it would catch water if it ever rained again. I wasn't going to leave you there. I was close enough to you so that I could see you in the distance, but far enough away that there was a chance that water would come. I waved to you every so often, and even though you didn't wave back anymore, I believed that you were still watching me. I felt that it was only decent that I should try and build something for us, since it looked like we'd be there awhile. It wasn't all sand, which I considered fortunate because there were plenty of rocks to work with. The stone was sand colored, with occasional variations that were more beige or white. First, I built a small turret tower and under it, an outdoor sitting room with clever places for a garden to grow, complete with low, curved walls where I imagined the tendrils and clutches of ivy. I built a giant stone basin where I imagined a pool of clear water, reflecting tall stands of snapdragon, foxglove, hollyhock. I carved whimsical, spiral windows in little stand-alone walls, where the sun poured through and cast charming shapes on the path below. I would grow boxwood shrubs, and carve them into elaborate animals. I imagined them, perched along the winding path, eager to greet you, like friends. As soon as there was water, I decided, I'd put them in. I would dam up the arroyo and make a lake. I carved a fine gazebo with fish and snails and crabs and ducks and geese twining themselves up the pillars, and thin, elegant kissing nooks inside. In front of the gazebo, I cut five satin smooth steps leading down to the would-be water. I imagined how we could sit there and see our reflections, dip our toes and feed the ducks that would come with the lake. When the first sandstorm came, I was unprepared. It was a calm, still afternoon, and then a low black cloud came hurtling across the plain. I didn't have a chance to do anything. The sandstorm winds came in exactly horizontal and strong enough to cut the head right from your body. Each grain of sand seared, bits of broken glass under the skin. I hid under one of the benches I'd carved, but sand nearly choked me, billowing in and filling all the moist places on my face; my eyes, my ears, my nose, my mouth. When it passed, I realized that I had to build a great wall around everything else I had made, to protect myself from the storms. I built the wall during that fine dust that lingers after a storm, and that inspired me to add a good, solid booth with a hinged door, like a telephone booth, to hide out in during the worst of storms. I didn't wonder what you did in those storms, out there on the plain. I could see you wouldn't mind them the way I did. I thought you might even welcome them, the blind dark they pulled over the cloudless sky. I could see how that might seem better for sleeping. Before I knew it there was a whole village. I had built small stone houses for the friends we used to have. I figured that even if they didn't want to move here with us, they might visit. Each house had a slightly different front porch, with plenty of room for vines and flowers to grow. In the house I built for us, I carved a great huge table out of the biggest stone I could roll in. I rubbed the surface with a bag of stones until it looked polished. I imagined how cool the table would feel on our arms when we leaned on it. How we'd have big glasses of water, no, pitchers of fresh cold water, and we would sit there, talking with each other, or with the friends who would visit. After a while, I realized that I'd been forgetting to wave to you. But when I went back to the first garden I'd carved, the wall I'd built blocked the way that led out to you. I decided that you were probably fine with that, relieved even, by my absence, and I went back to what I was doing. Some days, small pebbles would grow sand shadows, tiny dunes that stretched away from them in languorous lines. Some days, sand would stream out from my heels like smoke as I walked the edge of town. I should have worried more over these phenomena. I only saw them as interesting aspects of desert living. I didn't connect them to the winds that howled, sometimes until sundown, outside of my booth. I didn't comprehend their essential design for ruin. In the village, I carved a pack of friendly dogs, as if they were running down an alley. I carved a couple of cats, too, sleeping in windowsills and stretched inside houses, in places where the sun came in the windows. I carved loaves of bread and bunches of carrots with their leafy stems on countertops. I carved bowls of peas and heaps of beans. I carved corn on the cob (every kernel included, and a few strands of silk), blueberry pies, hunks of cheese, carafes for water and wine. I set some of the tables with knives and forks and napkins of stone. I carved a wicker laundry basket, left beside a bed. I carved two hairpins on a table by a mirror. I carved toys scattered on the floor in a room. I carved a room full of musical instruments in another house. Then there was a bad stretch of sandstorms, and I spent a lot of time cooped up in my booth. I breathed sand and spit through my shirt. Sometimes, though, it felt like the hot wind, full of those minuscule bits of stone, was packing my throat closed, trying to suffocate me. I sat on the floor of the toll booth and sometimes, without meaning to, I cried. This made everything worse, as the sand stuck to my eyes and face and often I would wake up to the aftermath of a storm with my eyes and mouth caked shut. After all those storms, I decided to take a long walk around my creation, to see what else it needed. I was proud, anticipating seeing the work. To think that you were out there sleeping, and I had built all of this. I had made miles of flat gravel plain into a small village. I had raised something from the particles of the desert. It was impressive, I told myself. You would be impressed. Then I noticed that all along the edges of the village, and in the garden, sand had worn my sharp edges, my careful cravings, away. The sandstorms had filled the gazebo! The fine, sleek steps were obscured by undulating waves of the stuff. The designs carved into the pillars had been pockmarked into unrecognizable shapes. Just a few blurred tails and wings remained to suggest there was ever anything there before. The stone basin was full and smooth when I reached it. The low, curved walls I'd made were piles of tumbling rock, with no mortar to hold them together. The strong winds had worn most of the spiral windows down to hard points that looked like thorns in the shadows they cast on the path. It looked as though I had built a ruin on purpose. In ruins there's no forgive rate, the decay begins and pursues its end relentlessly. Nothing can shore up that which has already broken, given up, given way under the heat, the sun, the sand seas. There was nothing I could do. I was broken-hearted. I thought of you. I thought you might help me. There was the wall between us, though. The wall had not fallen yet. It stood intact, as walls mysteriously do. I decided that I would build another turret tower, climb it and get your attention. Maybe you would see my frantic waving, you would rise, shake yourself, come running. Maybe you would not want to see my work in ruins, maybe you would feel compassion for me, for what I was trying to do. Maybe you would help me dig the ruins out. Maybe my catastrophe would be the thing to wake you from your sleep. I used the tumbled down stones of the low garden walls to build a tower. When I finished, it was crooked and rough, nothing like my earlier work. There were gaps clearly showing, and angles which should never have been allowed. Climbing it took a while. But once I was up there I turned and saw all my work below spread out in varying degrees of ruin. Even the little village was bulking up with sand already, each house becoming a dune. All that I had made was vanishing. And it was all so colorless! The world I had built, I saw that it was all the same terrible color as the rest of the desert. It was as bleak, as beige, as white, as hot, as airless. I looked at the desert for what it was. Endless colorlessness. Endless scorch. Endless thirst. Endless sand. Endless stone. Endless horizon. No water was going to come there. No water could exist there. What I had dreamt of, what I had built, could not exist. In the shimmering and wavy heat, my head spun, and suddenly I saw that the ruins did not exist, either. Not the things I believed I'd built, nor the ruins of them. There was only the long, unequivocal, relentless desert. What I had built was mirage. With the mirage gone, there were only long rows of heaped sand. My footsteps had treaded certain paths. But nothing more. No ruins. No decay. There could be no decay, I realized, because building was not possible there. I turned around again and again, delirious in my dismay. That's when I saw you. Your great, humped figure, supine in the sand. You did not move. You had not moved since I'd last seen you. You had become utterly stone. The stockpiled moments of your life, like grains of sand, had solidified around you. They lay upon you, inert, all weight. You were the heft and bulk of stone. Just then I realized that if some of it was mirage, all of it was mirage. There was no stone tower below me. I was standing in mid-air. I could plummet, burst open like a ripe fruit, my blood soaking into sand and gone. I felt myself teeter. I decided that I would not fall. I would walk. I would walk over your desert, over your prone form, over sandstorms and gravel plains, through the sky without clouds, right on out to the horizon that beckoned.